Ed here: Bill Pronzini's contributions to the genre of crime fiction have been enormous. First he created the groundbreaking Nameless series (stronger than ever) second he wrote numerous stand-alones and stories that have won praise and awards world-wide and third he has compiled a body of excellent literary biography and criticism that needs to be collected and published. Here is an example from Mystery*File. Elliott Chaze (1915-1990) was an old-school newspaperman who began his journalism career with the New Orleans Bureau of the Associated Press shortly before Pearl Harbor, worked for a time for AP’s Denver office after paratrooper service in WW II, and then migrated south to Mississippi where he spent twenty years as reporter and award-winning columnist and ten years as city editor with the Hattiesburg American. His first two novels were literary mainstream. The Stainless Steel Kimono (Simon & Schuster, 1947), a post-war tale about a group of American paratroopers in Japan, was a modest bestseller and an avowed favorite of Ernest Hemingway. The Golden Tag (Simon & Schuster, 1950), like most of his long works, has a newspaper background, contains a good deal of autobiography, and is both funny and poignant; it concerns a young wire service reporter and would-be novelist in New Orleans who becomes involved with two women, one of them married, while reporting on a sensational murder case. 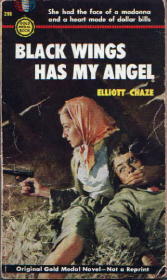 His third novel was the one for which he is best remembered today, Black Wings Has My Angel (Gold Medal, 1953; also published as One for My Money, Berkley, 1962 and as One for the Money, Robert Hale, 1985). For those seeking more news on the late Elliott Chaze--the best Mississippi author you never heard of-- please check out his fan page. Trying to accumulate as many 'likes' as possible so feel free to 'like' this FB fanzine. Thx. https://www.facebook.com/Elliott-Chaze-fan-page-114645885234829/?